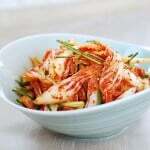 In late fall, Korean homes make enough kimchi to last through the winter and early spring. By this point in spring, the kimchi has aged and tastes pretty sour. 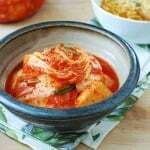 While old kimchi is great for dishes such as kimchi jjigae, kimchi jjim, kimchi jeon, etc., we crave fresh kimchi. 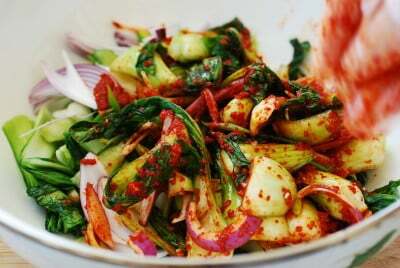 This makes a salad-like kimchi, called geotjeori (겉절이), a popular spring dish. Geotjeori is made in a small amount for immediate consumption without fermentation. 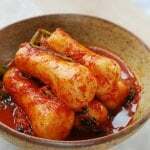 Geot means outer or outside, and jeori means salted or pickled, so the name, geotjeori, implies that the vegetables are lightly salted unlike normal kimchi, which is fermented. 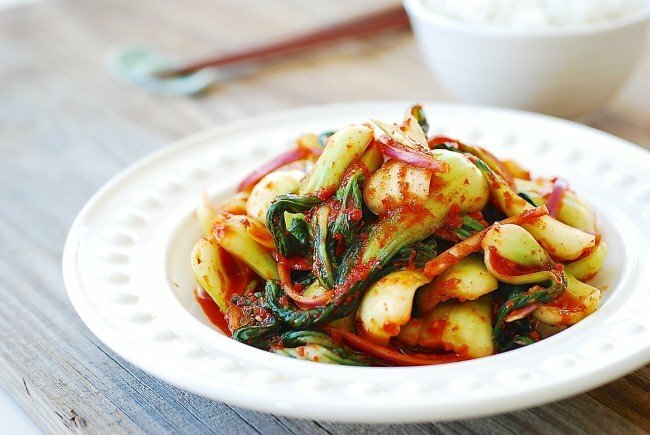 Geotjeori is typically made with napa cabbage or other varieties of cabbages such as young cabbage called putbaechu or spring cabbage called bomdong (봄동). Here, I made it with tender baby bok choy. 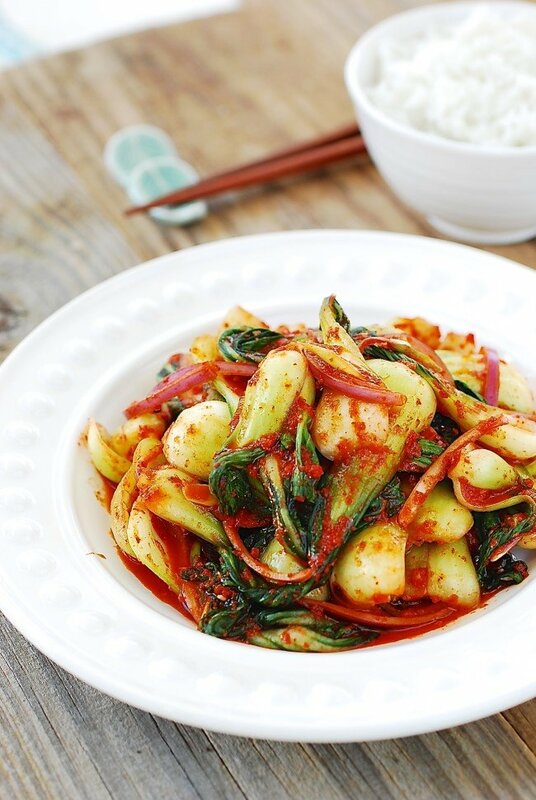 In Korea, bok choy is called cheongyeongchae (청경채), so the name of this dish is cheonggyeonchae geotjeori. Typical kimchi seasoning is used to make geotjeori. Every household makes it a little differently. My mother adds sesame oil to her geotjeori, and some of my friends even add a little vinegar. 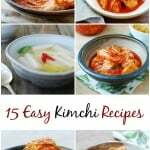 So, here’s a quick and easy recipe when you need to whip up a kimchi substitute or when you want fresh kimchi. 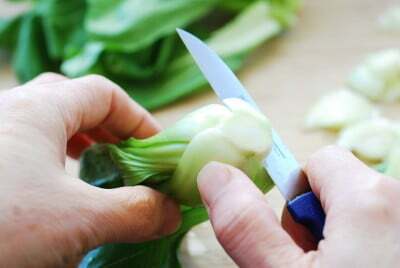 Separate the leaves by cutting off the stem of each bok choy. Rinse and drain. 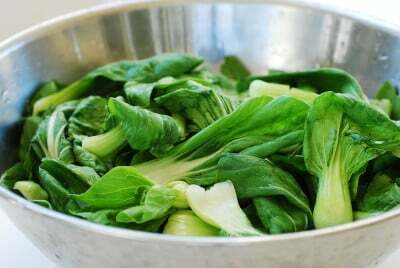 Place the bok choy in a large bowl, sprinkle with the salt, and toss well to coat evenly. Leave it for 30 to 40 minutes until softened, flipping over once halfway through. 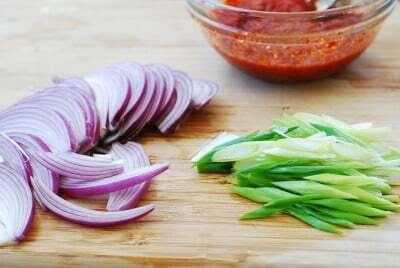 Thinly slice the onion and scallion. Combine all the seasoning ingredients in a small bowl, and mix well with 3 tablespoons water. Rinse the bok choy twice and drain well. Add the onion, scallions, and seasoning mix to the bok choy. Using a kitchen glove, toss everything well by hand until the bok choy pieces are well coated with the seasoning. Add a little salt or more fish sauce to taste. 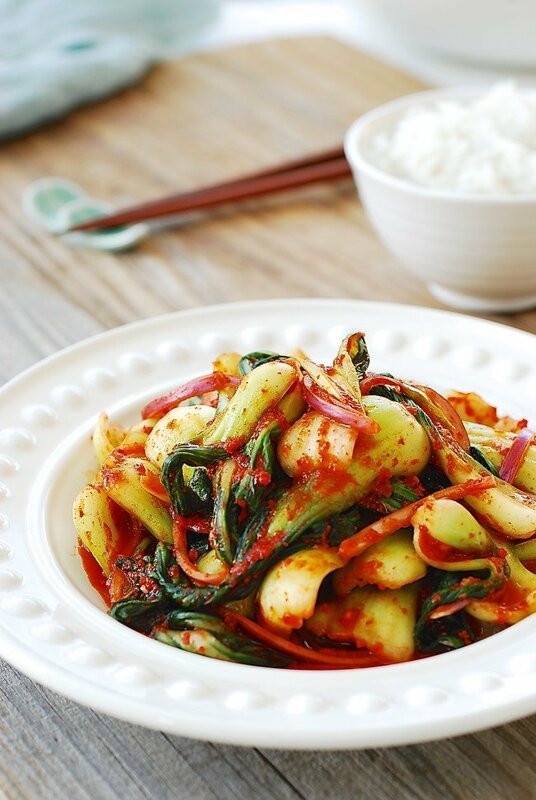 I love bok choy and this looks like such a spicy, flavorsome and delicious way to cook and eat it. Yes, it is! Thank you for visiting! That looks scrumptious! 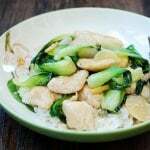 I can’t wait to try it because bok choy is one of my favorite veggies. Thanks for sharing! Great! Hope you try it soon! Thank you for stopping by! It’s delicious! 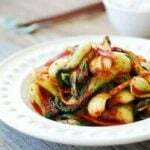 I’ve never known that I could make Geotjeori with bok choy. It was a good introduce and you boast our Korean food Kim-chi.GREAT! Thank you to teach me how to make kimchi. It will be very yummy. When I saw your kimchi pictures I was very hungry because it will be delicious. You’re welcome! It’s pretty easy to make so hope you try to make it. 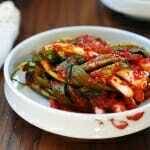 Love kimchi of any kind will have to try. Thank you for the recipe. This is an easy one to try. Enjoy! It looks great, can I make geortjuri with left over kimchi I make, by just adding some sesame oil? Also I’m vegan so what can I substitute the fish sauce for? Of course, you can. That’s what we do often when we make kimchi. Simply omit the fish sauce and add more salt. 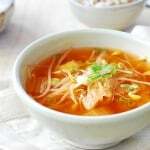 You can enhance the flavor by adding a bit more of aromatic vegetables such as garlic and ginger, if you want. Enjoy! This was beautiful as well as delicious. I thought it was a little salty, and may cut down on the fish sauce. 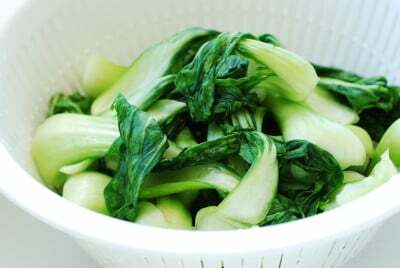 Since it was to be eaten fresh and not fermented I wondered if you could just wash the bok choy and not salt it. It would be like a fresh western salad, but with the Korean yummies. Yes you definitely could do that. How spicy is this dish? I can’t eat spicy food but a little bit of kick is fine… And instead of korean pepper flakes can I just use regular pepper flakes? It will be a bit spicy. Yes, you can try with different pepper flakes. It will be different but I am sure it will be good. Try it with a little bit of peppers if you can’t eat spicy. Thank you for this! This is one of my absolute favorites with hot rice. Almost exactly how my mom makes it, but now I have the recipe nicely outlined with photos. You’re welcome! Great to hear this is how your mom makes it. This recipe seems like it makes a lot of food, but I unfortunately have a small stomach and can’t ever eat much at once. Will this recipe keep in the fridge so I could have it with several meals over the course of a week or so? How long can you leave this in the fridge for? Is it still good the next day? Yes it will be. Should be good for a few days. Enjoy! Yum! Love all your recipes. How long will this baby bok choy kitchen keep in the fridge? It will be good for a few days. Enjoy! Nice! Glad you tried it.